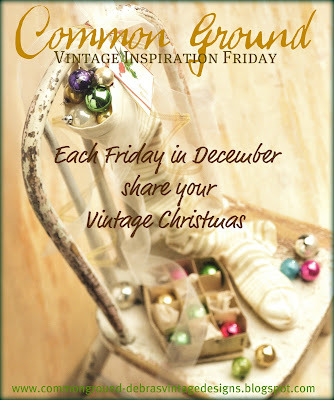 common ground : Vintage Inspiration Friday #14 Join the Christmas Fun! 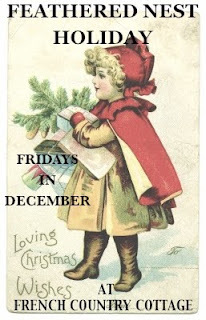 Vintage Inspiration Friday #14 Join the Christmas Fun! I honestly cannot believe it's December! my turkeys have finally left the building! 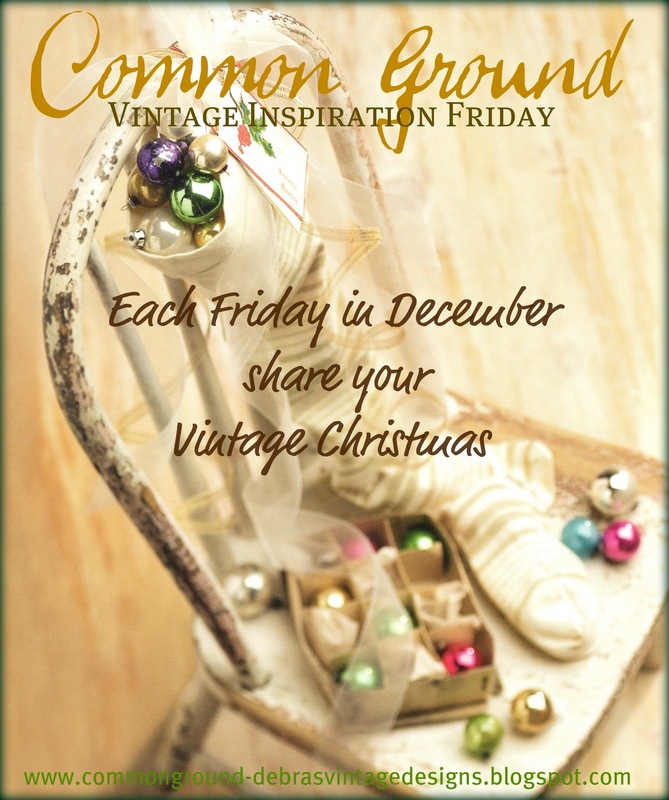 vintage and vintage inspired Christmas goodies. so others can join the Holiday fun! I needed to take a break and change out the sunroom. at Leola's Christmas Open House. And this year I tried bleaching some old bottle brush trees and wreaths. So a few of them are dressing up my little house for the Holidays. it's turning out to be so much fun in the "new" kitchen. I love bottle brush trees, especially vintage ones. And the tiny zinc Christmas message is too cute. thank you for a new party...and inspired by vintage Christmas....I am looking forward to seeing everyone's treasures...thanks for hosting! I have loads of vintage Christmas stuff, although I might have to fudge and re-post a few from last year. Oh how I love bottlebrush trees. I'm so happy they have been making a comeback the past few years. Yours are so colorful and cheerful and looks fantastic on your shelves. I'll see what I can come up with!! Hello Debra, love all of your decorations... the little trees you bleached look so cute at the little shabby house, and I also LOVE your zinc plant marker!... hope I linked up right, will you check and see? There was a red X by mine (am I blackballed or something, tee hee hee???)... xoxo Julie Marie PS Thanks for hosting this fun party! ...your room looks like an indoor greenhouse, so bright and cheerful!! Debra, I love your little house, and the trees, haven`t had time, to decorate myself! Everything is so pretty, Debra. Is it hard to bleach the wreaths and trees? Happy Thursday! LOVE your post, the little house with the bleached bottle brushes is "MY FAVORITE", BUT I also get weak in the knees for Shiny Brite...AH the memories!!! Love those bottle brush trees...can you tell from my party post? LOL! Thanks for the fun, Debra! Love that white pot your evergreen is sitting in. And I can't wait to see photos of your kitchen! 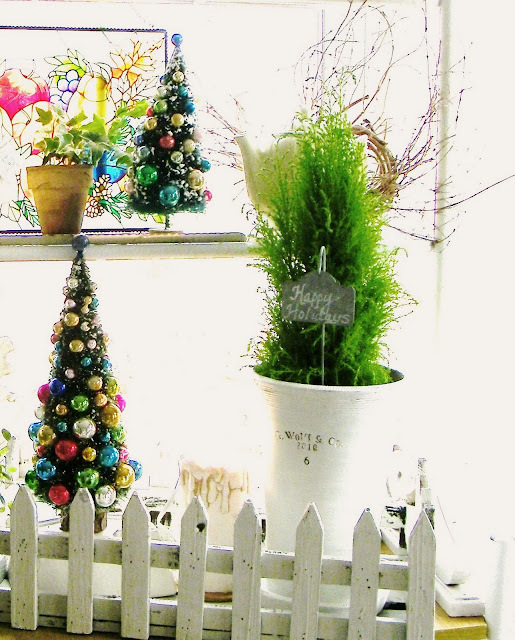 Hi Debra, it's all so lovely, especially love the little house the cute little trees!!! Thanks so much for hosting! Love everything, Debra! What a great party...I'll try to join next week! I think we are all a bottle brush loving group. The trees with the ornaments are just perfect. Love that sunroom! Love the trees and specially love the white picket fence. Thanks for having such a fun party for us all to join!! I appreciate your efforts, especially during the holiday...there is just never enough time!!! Your little trees with the Shiny Brights are so fun & colorful & your little house is delightful. Thanks so much for sharing friend! Love those Shiny Brites! It's beginning to look alot like Christmas....Happy Holidays, Debra! That's it, I'm gonna start stalking fleas for some shiny brites over the next year :) Those trees are so cute! love those little trees! can't wait to see Christmas in the new kitchen! Would you believe I haven't done a thing...not even an icicle...unless you count the ones from last year that I missed with the vacuum! At least you can say you're redoing your kitchen...I have no excuse. I'd have to use last year's photos to play this week...but I'll play next...I promise! I'm so glad you started with the sunroom. You know how I feel about that magical room! Thanks for hosting each week. Such a fun and 'inspirational' time here. Also Wanted to say how much I love those trees in your post!! They are delightful! Thanks for hosting such a fun party. Can't wait to get around and visit everyone. Hi Debra...your wreath on that little fabulous (bird?) house is adorable! I have been looking forward to today all week!! Ohhh, I love your sunroom! Too pretty. Your blog and how you share your faith is so great! I just linked up to the party, and I'm your newest follower! Can't wait to check back. I LOVE your little display SO cute! :) Anything vintage Christmas is my favorite! LoVe the Look of vintage trees loaded with shiny bling ornaments!*!*! Your home always looks so pretty! I just love your bottle brush tree! Good luck with your kitchen redo. We painted our kitchen cabinets white earlier this year and am so glad we did. It was a lot of work, but I love the way it turned out! Very cute bottle brush trees. I am a sucker for those things. I am going to try to bleach some this year. Do they have to be vintage or can I do it with the sisel ones I saw at Home Depot? And thanks for hosting. Your decorating is just beautiful! As for the little organizer that "needs something" how about putting ornaments that have lost their hangers, maybe even vintage ones? Or I would look for other little orphan Christmas decorations to decorate it with to brighten it all up with some sparkle! I am canning applesauce today, so I need to get back to stirring, but thanks so much for hosting this party! Love it! Shiney & bright, just the way Christmas should be. That little chippy birdhouse is the coolest. Everything is yummy! Thanks for this fun party Debra! Hi Debra, Better Late than Never, Right? I hope you are having loads of fun in your kitchen! Can't wait to see!! I *will* join one of these days...everything I do is vintage inspired so I should have plenty of material...thanks for the sweet comments on my dd. Have a wonderful season of celebration! Bright and beautiful, as always! You always brighten my day when I come by here.